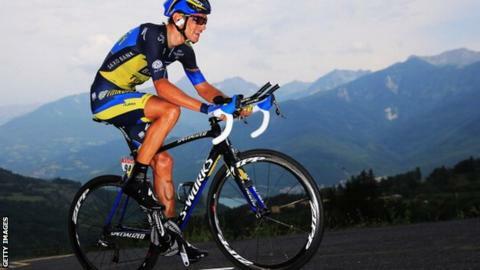 Czech cyclist Roman Kreuziger, fifth in last year's Tour de France, has been cleared of any doping offence by his national Olympic committee. He was withdrawn from this year's race because of possible irregularities in his biological passport. But the rider's Tinkoff-Saxo team said that 28-year-old Kreuziger is now free to continue racing. "The team is very happy he has been cleared and that he is is now eligible to resume racing," a statement said. "He was found not guilty for the alleged abnormalities in his biological passport profile." "At first glance this looks like another case of an athlete's national body taking a suspiciously lenient view in a doping case: Spain's acceptance of Alberto Contador's contaminated beef excuse springs to mind. But what if Roman Kreuziger is right about his biological passport - the supposed gold standard in the fight against doping - being skewed by a medical condition? After all, this is not the first controversy about a 'positive' triggered by a fluctuation in a blood profile. The International Cycling Union and World Anti-Doping Agency will almost certainly appeal the Czech ruling at the Court of Arbitration for Sport. They have to. They have too much invested in the biological passport not to." Kreuziger began 2014 by finishing third at the Tirreno-Adriatico in Italy and claiming eighth in the Tour de Suisse. But he was pulled from his team, although not technically suspended, before the Tour de France. The International Cycling Union (UCI) decided to ban him provisionally in August pending the Czech Olympic Committee's ruling. The UCI said in a separate statement it would consider an appeal to the Court of Arbitration for Sport. It has one month to lodge a challenge. The data in question is from Kreuziger's biological passport in 2011 and 2012, when he was riding for the Astana team.